Venezuela’s socialist government alleged Sunday that the detained suspects conspired with others in Miami and the capital of neighboring Colombia, though they offered no specific evidence. Opposition leaders criticized Maduro for broadly singling out his political opponents, and they warned that he might use the attack to further suppress his critics. Maduro and his allies called the attack direct proof that an international plot to overthrow his socialist administration exists, while also saying that the military’s response shows he still has the loyalty of Venezuela’s soldiers. “Seeing trained soldiers fleeing in apparent panic and disarray before an explosion strongly contrasts with the idea of monolithic control and loyalty of security forces that Maduro prides himself on,” the New York-based Torino Capital investment firm said. 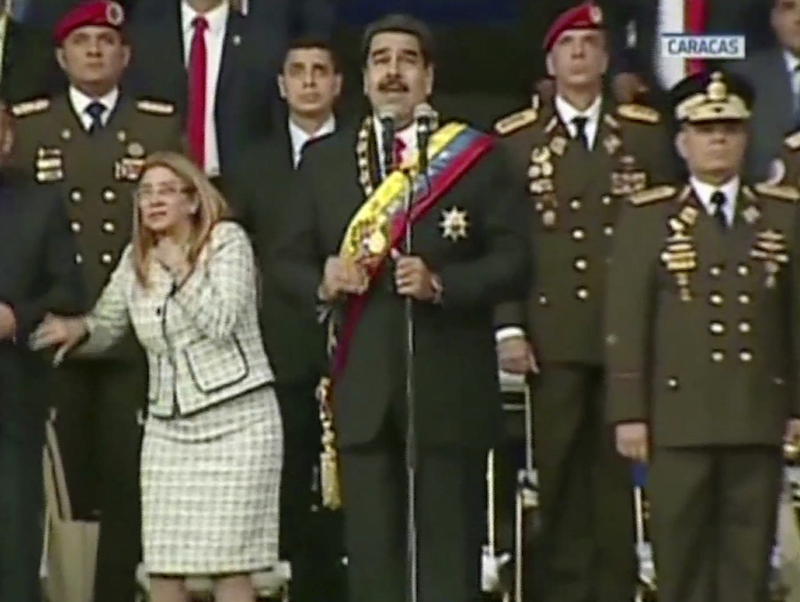 Defense Minister Vladimir Padrino Lopez, appearing on state television Sunday, said the attackers were trying to wipe out Venezuela’s entire top leadership along with Maduro. Reverol said two of those arrested had previous run-ins with the government, although he did not give their names. He said one took part in 2014 anti-governments protests that rocked Venezuela’s as it descended deeper into an economic crisis that is now worse than the Great Depression. The other had a warrant out for his arrest for participating in an attack on a military barracks, the interior minister said. Investigators continued searching the blackened apartment building near the speech site, and authorities said officers also raided six hotels, where some of the suspects were arrested and “film” evidence was collected. Officials gave no details. In an address to the nation later Saturday night, a visibly shaken Maduro blamed the attack on the “far right,” and he called on U.S. President Donald Trump to hold the “terrorist group” accountable. “It’s evident that the initial reaction of the government isn’t aimed at attempting to clarify what happened but rather to take advantage of the situation and irresponsibly and sweepingly attack the ‘opposition,'” the group said in a statement. “It was not successful today, but it is just a matter of time,” the group said in a tweet. Venezuela’s government routinely accuses opposition activists of plotting to attack and overthrow Maduro. The former bus driver has moved steadily to consolidate power as the nation struggles to reverse hyperinflation that the International Monetary Fund projects could top 1 million percent by year’s end. Maduro said the attack left him convinced of the military’s support and undeterred in carrying forward the socialist revolution begun by the late Hugo Chavez. “Venezuela will continue on the democratic, independent and socialist path,” Maduro said. 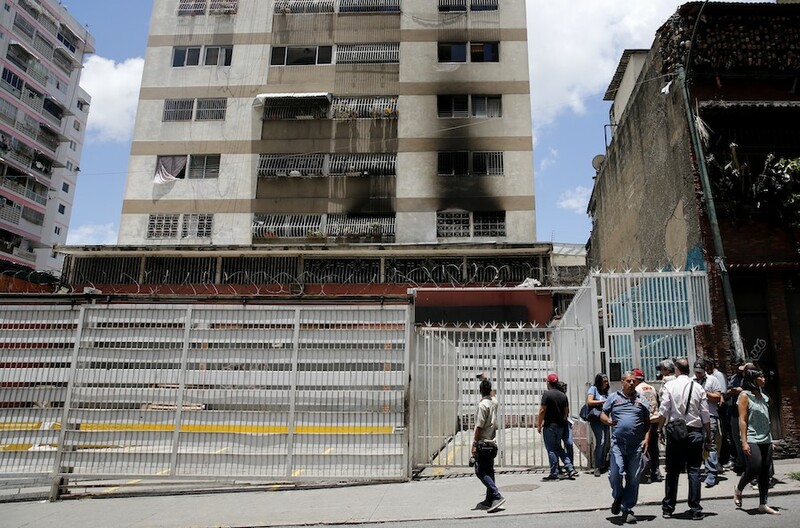 Analysts believe Maduro still holds the military’s support, but also said the attack was an embarrassment for a government that prides itself on control and invincibility. Associated Press writer Scott Smith reported this story in Caracas and AP writer Christine Armario reported from Miami.